Yesterday comScore published survey results for EU5 (France, Germany, Italy, Spain, UK) on smartphone use and installed base. The headline is very similar to what would be written about the US: Android had phenomenal growth over the last twelve months. I also noted that the apparent growth of Google (16.2% share change) seemed to be matched by an apparent decline of Symbian (-16.1% share change.) However the reading of the data is not so simple. The bar chart shows that three platforms gained users in the last year (ending July) and that there were negligible losses in users by others. Negligible except for non-smart phones. A remarkable 29 million users moved from non-smart phones to smartphones. Those switchers switched into Android (16 million), iPhones (6.3 million) and RIM (3.4 million). Symbian even gained about 330k users. Microsoft lost about 1 million but its platform has not been actively promoted in that time. When seen as a pie chart, you can see how the usage shifted from non-smart to smart even more clearly. 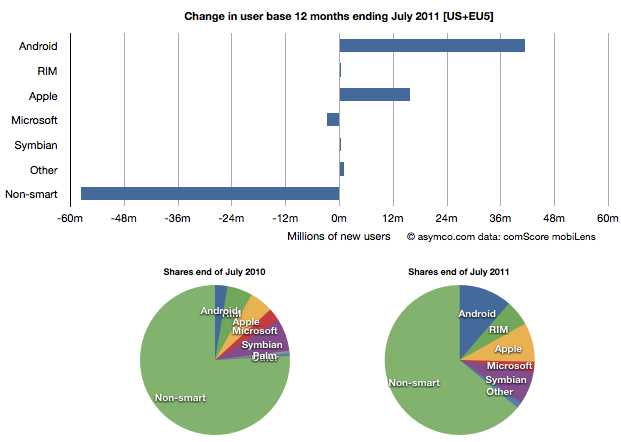 It does not appear that Android took share from Symbian at all. 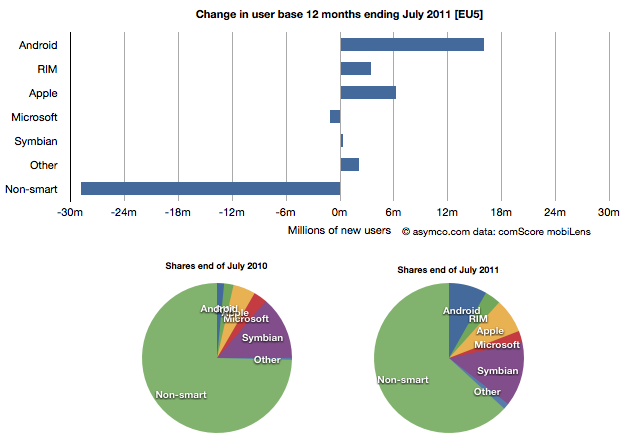 Android took share from non-smartphones. The table in the link from comScore leads one to conclude otherwise. I took the same approach to look at the US data (also from comScore). It shows a similar pattern. 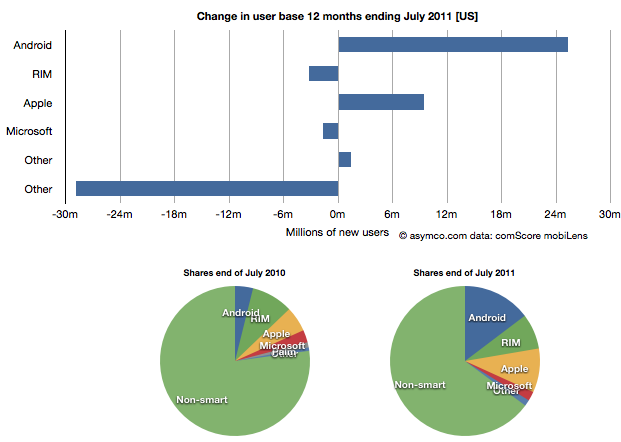 In the US, RIM was a net usage loser but its losses also paled to the losses of non-smart devices. In comparing with EU5 the pattern is very similar. This shows the change in platform phones more or less being from non-smart to Android and iPhones. The total population is 470 million people–not insignificant. The total number of non-smart devices abandoned is nearly 60 million in one year, which equals the total number of new smartphone users. That’s 12% of most of the developed world switching in one year. If this keeps up, the “tipping point” when smartphones will outnumber non-smart phones in use in these large markets will be in another year. In terms of sales rate, the tipping point has already happened. Sales of smartphones crossed over in the US and Europe several quarters ago (November 2010 in EU5) and the trend is accelerating. Furthermore, if patterns of mobile technology adoption repeat as they have for the last two decades, emerging markets will follow in two to three years. This tipping point observation has been repeated on this site a number of times when reflecting on the data in the US. Now it’s becoming clear that the same pattern has been underway in Europe as well. The big picture from the survey data is just how vast the demand for smartphones is. Some platforms are benefiting more than others in terms of share of growth, but the biggest mobile loser is clearly the non-smart phone. Not only is it an unprofitable product for almost every vendor, it is also being increasingly shunned by buyers. 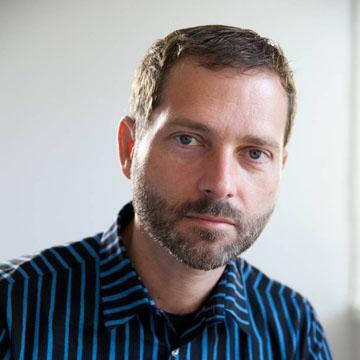 At the same time, at 450 million users we’re still only looking at less than 10% of the market. As this pattern spreads globally the platform install bases will be measured in the billions of users.